We have waited considerable time for Huawei’s listed products to show up in India and now Huawei Ascend P6 (Quick Review) has finally arrived on Flipkart. This phone comes with a beautiful and premium razor thin body design and also enjoyed the status of being the world’s slimmest phone for a week with only 6.15 mm body thickness. This phone is powered by a Huawei’s own K3V2 chipset with 1.5 GHz Quad core processor and is supported by 2 GB of RAM for efficient multitasking. The processor is based on Cortex A9 architecture which makes it superior to Cortex A7 based Mt6589T at least on paper. The GPU present has 16 cores. Internal storage is 8 GB and in spite of the sleek body design you will still get a microSD card slot for extending storage up to 32 GB. The phone runs on Android 4.2 jelly bean operating system with Emotion UI on top. It sports a 4.7 Inch comfortable to hold IPS LCD screen with 1280 X 720 pixels and corning gorilla glass protection. The pixel density is 312 pixels per inches which is pretty good. The primary Auto focus camera is of 8 MP and is capable of Full HD video recording at 30 fps. The camera enjoys LED flash support for low lighting conditions. The front camera of 5 MP is also capable of HD recording. The battery capacity is 2000 mAh and Huawei has provided with software and hardware optimization, like packing the Antenna in to the plastic section at the bottom for this battery to last long enough. Connectivity features include 3G, EDGE, WiFi, Bluetooth, GPS with AGPS support, GLONASS. It however lacks 4G support and NFC. 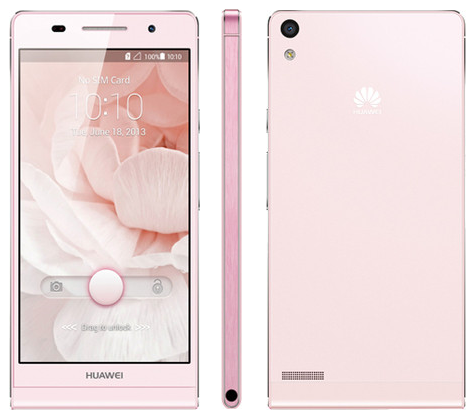 Huawei has presented with a phone which provides specifications similar to Phones like Gionee Elife E5 but the USP of this phone will be its body design and built quality. This phone has been listed on Flipkart with a Coming Soon tag for Rs. 28,990. We expect the best buy price to be around 30 thousand. At this price range it will compete with phones like Nokia Lumia 925, LG Optimus G pro and Sony Xperia Z.